A significant stomp forward, destined for pedalboards everywhere! Polyphonic mode is a revelation. Brilliant battery access. Bright display. 2mA power out for other pedals. No sweetened tuning. No non-silent output. What's the most important pedal on your board, that's also the least exciting and is more often than not the most irksome one to buy? You're dead right: it's the humble tuner. Yet if you play live and hold even a shred of respect for your audience, an onstage tuner is a must-have piece of hardware. Effects giant Boss currently has a vice-like grip on the stage tuner market, so what can Danish effects company TC Electronic bring to the table? Well here's the revelation: the all-new PolyTune has the ability to show you, with one full strum and in one single display, whether all six strings on your guitar are either sharp, flat or in tune. Now that, tuning fans, is big news. The PolyTune originates from the Thailand factory that's also responsible for the beautifully made TC Nova and G-System products. It comes in a robust, space-efficient metal case and practical niceties include input and output jacks mounted securely at the same height as standard Boss Compacts (and indeed many other compact pedals out there) so you can use cable-less straight plugs. Battery access for the single nine-volter - which TC claims will give you approximately six/seven hours of use - is a breeze, as it involves just one impossible-to-lose thumbscrew on the reverse. It's a new and neat design. There's a 9V centre-negative mains barrel jack and, when using a suitably currented adaptor, the PolyTune also has a power output enabling you to daisy chain other 9V centre-negative pedals up to awhopping 2000mA (most pedals draw around 35-50mA), thus making it both your tuner and your power supply. The large display houses 109 tiny LEDs to light the various functions. We've used it at pub gigs, on a very brightly lit concert stage and at an outdoor daytime gig with no visibility problems - the LEDs dim automatically in low light conditions and get brighter when there's more light. The PolyTune features true-bypass switching, meaning that when it's off, it's completely out of your circuit and won't affect your tone. It's a feature not present (and therefore bemoaned in certain circles) on the Boss TU-2, but to be fair, enough pros use TU-2s to render that a moot point. In any case, true bypass it is. We noticed some extraneous noise as the LEDs refresh during tuning (though that was only with two overdrive pedals also on, after the PT, at gig volumes - it's negligible otherwise), though TC tells us this niggle has been completely fixed for final production units. See the PolyTune in action here at Winter NAMM 2010. Regardless of whether you're in stream mode (LEDs move left to right and vice versa for flat and sharp respectively) or needle mode (an LED representation of a tuner needle), you simply strum all six strings, open. The PT realises what you're doing and lights six pairs of green LEDs. Red LEDs appear either above (sharp) or below (flat) the green ones, giving you an overall picture of what's in tune and what isn't. You then play an individual string and the display changes instantly to full information for that particular string. It's very quick in use, with no skitting, and it's accurate too - TC is claiming +/- 1 cent compared with Boss's +/-3 for the TU-2 (the new TU-3 will be +/- 1 cent). The PT will also work with four-, five- and six-string basses, though if you're using a capo or altered tunings you can only use the regular chromatic, single-string mode. Polyphonic mode only works with standard intervals in either E, Eb , D, C#, C or B (down tune only). But perhaps the presence of the USB port on the pedal hints at software updates down the line. 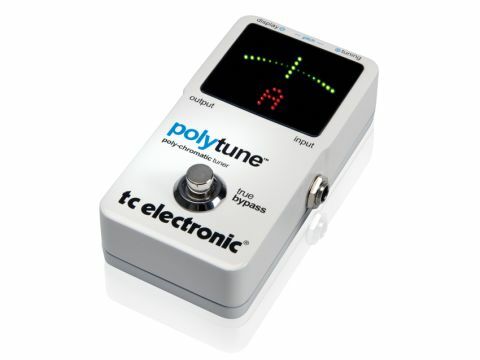 The PolyTune is a genuine step forward for pedal tuners. It won't satisfy sweetened tuning fans, yet what the vast majority of people want the vast majority of the time is to simply tune quickly and silently between songs. Were it a straight automatic chromatic tuner it would be good, but by adding the polyphonic mode for an instant view of all six strings, it becomes an undoubted winner at a very reasonable price. Highly recommended.